The 243 Winchester round has been a staple for small game hunting as well as target and long-range shooters since it was first introduced in 1955. Accuracy in all these applications is critical, especially at long range, and the addition of a scope to your 243 rifle will greatly improve your grouping and make shooting more enjoyable. Choosing the best scope for 243 Winchester can be overwhelming, but here is a look at 5 of the top options to improve your marksmanship. Scopes come in a seemingly endless variety of styles and features so it is important to have a way of evaluating each product by a particular set of questions. Arriving at these questions is usually determined by asking yourself how you intend to use the scope, and how far away your target will be. We will break this down by sections to simplify the process and help you dial-in on choosing the best scope for the 243 Winchester. Hitting your target at short range isn’t always easy, but it’s usually possible to make those shots with minimal skill level thanks to the accuracy of modern rifles. Hitting longer shots, upwards of 350 yards and above, takes some skill which can be honed over time, and the addition of the right scope to make it possible. Targets in this range are close enough that scope magnification of 1x to 4x should be sufficient. Higher levels of magnification won’t make hitting your target easier in short range situations so it’s important to accept that higher magnification values aren’t always better depending on the application. There are also fewer considerations about light absorption and maintaining zero when shooting at short range. Hitting your target at this range is more easily achieved finding a scope in the 5-9x magnification range. Consider the size of your target, however, in refining that choice within the range. Hitting smaller targets at the upper end of the range may require at least 9x. Consider a target the size of a squirrel at 250 yards and you won’t be comfortable with anything less than 6x magnification under most circumstances. For this range, regardless of target size, you will be looking for maximum magnification and clarity. The minimum magnification in this range is 9x, but you may wish to increase that depending on your budget and specific target application. Greater shot distances also invite other considerations such as light absorption and the overall quality of the scope’s optics. Aside from magnification making it possible to find your target at long range, it’s also important for a scope to function well under different lighting levels. Weather can wreak havoc on your ability to see distant targets when cloud cover or deep brush creates a low light environment. Scopes which offer at least 90% light transmission, and sometimes even higher, will provide the clearest image in even the most challenging lighting conditions. Ignoring this specification can leave you at the mercy of mother nature at the most inopportune time. As with most products, you get what you pay for. This is especially true for scopes where poorly made products do not stand up to the test of time. Scopes with insufficient environment seals can allow dirt or moisture to penetrate the optics and obscure the image clarity. Scopes made with weaker materials can be dented easily from being dropped or bumped which can create a distorted image and limit light transmission. Most high-quality scopes are nitrogen-filled and O-ring sealed for fogproof and waterproof performance in any type of environmental condition. They are also made of shock-proof materials to withstand the abuse of shooting and the occasional impact or being dropped or mishandled. When you’re shopping online, sometimes checking the reviews can give you an idea of a scope’s overall durability based on real-world experiences. It’s a simple question: Does the scope stay accurate over time and at varying distances after being sighted in? This is often referred to as “holding zero,” which describes scope’s ability to hold a tight shot grouping at various distances. Scopes which require frequent adjustment can be more cumbersome and less reliable when distance or target size changes. By most accounts, “zero” is considered a tight grouping at approximately 300 yards. This provides for leeway to go above or below that distance which may be considered an average range for most 243 Winchester applications. For your specific application, you might choose a distance higher or lower than 300 yards to set as your “zero” parameter for where you expect the scope to provide a tight grouping under any environmental conditions at a given distance. One of the most basic questions to ask when choosing the best scope is to determine how quickly a target can be acquired when you put your eye up to the eyepiece. Some scopes feature “quick focus” which allows for faster focus adjustment and quicker target acquisition. Not every shooter, however, appreciates this feature, as some prefer scops with the older style locking focus ring which may need less adjustment depending on your shooting style and target distance. Now that you know what to look for, and how to evaluate a scope, here is a list of the 5 best scopes for 243 Winchester. This is the Leupold VX-2 4-12x40mm compact scope which is waterproof and fogproof. 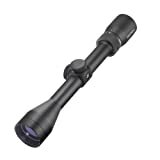 It offers 4x to 12x magnification which puts in the medium to long range category with regard to target distance. Leupold scopes also come with a full lifetime guarantee that offers repair or replacement if the scope ever fails to live up to expectations in the field. This scope also provides higher light diffusion which leads to higher clarity at greater distances. The zoom ratio is 3:1 which offers the ideal setting for most any situation. The Leupold VX-2 4-12x40mm is also very light in weight, coming in at just under 12 ounces which means it doesn’t add much extra weight to your rifle. The crosshairs are very fine yet distinguishable and will not obscure the target at greater distances which can be the case for crosshairs that are too large or overbearing. Some drawbacks include a fairly narrow eye relief, but that can often be expected from a scope in the 4-12x magnification range. It’s also missing features such as a graduated reticle which are premium additions sometimes found on scopes in this price range. The Vortex Crossfire II 3-9X40 is specifically designed for hunters and shooters looking for the highest levels of reliability and durability. Sitting in the 3x to 9x magnification range, this scope sits firmly in the medium range category. It also boasts full waterproof and fogproof protection even under the harshest conditions since it is nitrogen filled and O-ring sealed. Since the magnification ranges down to below 4x, the Vortex Crossfire II 3-9x can be considered for dual-use in hunting and tactical situations. For this reason, it also features a fast-focus eyepiece so adjustments can quickly be made on the fly as situations change. The optics are high quality, featuring anti-reflective, fully multi-coated lenses which produce bright and clear images for any scenario. Every air-to-glass surface on this scope is covered with anti-reflective coatings to provide greater light transmission. Special care was also taken with the external finish which is a low-glare black matte to lessen sun reflection and increase concealment of the shooter’s position. The Vortex Crossfire II is built to last made of solid block aircraft-grade aluminum for maximum strength and durability over the long term. Related Read: Review of the Vortex Crossfire II 4-12×44. Bushnell is a name that has been synonymous with high-quality optics since the late 1940s and their Multi-X Trophy 3-9x40mm rifle scope is no exception. Providing up to 9x magnification, which is plenty for medium range shooting, the Multi-X Trophy features fully multicoated lenses which provide up to 91% light transmission. This scope is designed for all-weather use and sports a nitrogen-filled O-ring sealed body for waterproofing and fogproofing. It also features 4-inch fast-focus eye relief for quick target acquisition and adjustments. The windage and elevation settings are finger adjustable which makes this scope user-friendly since it requires no special instrument to make changes in the field. The reticle in the Bushnell Multi-X Trophy features four long posts which create a narrow gate where fine crosshairs help to establish your exact point of aim. This approach has been called a “breath of fresh air” in an industry which is sometimes afraid to make reticle improvements for fear of stepping out of historical norms. At just over 13 ounces, it is also on the lighter side which means less added weight to your rifle. It also comes with Bushnell’s “No Questions Asked” lifetime warranty which provides for repair or replacement should the scope fail at any time. Nikon is a brand known of premium quality optics and photography which translates well into the market of rifle scopes. The Buckmasters II features a build that provides extremely high-resolution images even when hunting in the worst conditions. The lenses are multi-coated for maximum light transmission, even in the hours of dawn and dusk. The magnification varies from 4x all the way up to 12x making this scope perfect for medium range to long range shooting. The windage and elevation adjustments are very easy to adjust by hand with positive-click feedback so you can tell how much adjustment you have made, even in low-light. One area where the Buckmasters II sits apart is the Nikon Bullet Drop Compensator (BDC) reticle. This unique design allows you to hold “dead-on” at much longer ranges by providing small dots on the lower part of the reticle to account for distance. The reticle also functions well for short range targets. Another unique feature to the Nikon line of scopes is the accompanying Nikon mobile app for smartphones which provides guidance when sighting in the scope. It’s called the Nikon SpotOn Ballistic Match app and it’s compatible with any Nikon scope equipped with the BDC reticle. If you enjoy mixing tech gadgets with the shooting sports, this one may be worth putting on your list. In addition to those great features, the Buckmasters II also comes with the industry standard nitrogen purged O-ring housing for complete waterproof and fogproof protection as well as a lifetime warranty. The Sightron SIH Series 3 is the third our list with a magnification range that dips down to 3x for shorter range shooting. In this regard, the SIH Series 3 may prove to be a good overall option if you intend to shoot a mixture of short to medium range targets. Topping out at 9x magnification will limit accuracy at longer range, but the versatility may be worth more than the occasional long-range shot. This scope is waterproof and nitrogen filled which offers a lifetime of internal fog protection from inclement weather. It also features multi-coated lenses for maximum light performance even under low-light conditions. The windage and elevation adjustments knobs are built solid and provide well-defined feedback clicks during adjustment. Some users report that the oversized knobs fit well into larger hands versus the minimal knobs found on some scopes. It also features a mil-dot reticle which provides you with a small set of dots on the vertical and horizontal lines in the center to account for wind and elevation without making adjustments to the knobs. Each dot accounts for 1 yard of movement per 1000 yards of distance. Using this feature can take practice, but for the seasoned shooter, it is another tool which sets this scope apart from a crowded field. Should I consider less-known manufacturers? – When you compare the offerings from some smaller companies, such as Sighton, to those from larger brands, such as Nikon, you may find that the smaller brands try to excel in a particular area by attempting to differentiate themselves. With almost every company offering a lifetime warranty on their scopes, it’s always worth considering several products and it shouldn’t scare you to purchase a less-known brand as long as customers offer solid reviews and it meets your needs. Is one reticle style better than another? – Not necessarily, much of it depends on your preference and the conditions under which you will be shooting. If you’re comfortable with a particular style, such as the mil-dot, then stick with it. If this will be your first scope purchase, then take the time to understand how each reticle is intended to function and visit a local retail store where you can take time to look at each one up-close and get a feel for how it affects the image. Some users feel that more advanced reticles create a distraction in the image, but there is no right or wrong answer when it comes to personal preference. Is expensive always better? – In some cases, yes, but not in all cases. Many hunters and shooting enthusiasts give great reports on products for budget-minded buyers. The build processes and technology have progressed to the point where even scopes made at lower price points provide great image clarity and solid performance. Plus, even the lower-priced scopes still come with a lifetime warranty so you can feel comfortable saving some money and still get a quality product. There are many considerations when shopping for scopes, and the information presented here will hopefully help you find the best scope for 243 Winchester. When you know what to look for in a scope, and which features should be standard, you can start to identify which products stand out above and beyond other manufacturers. Lifetime warranties and weatherproofing features are fairly standard across the industry, so be on the lookout for other distinctions that will set similar models apart. Build quality, in some cases, can be more important than a long feature list if you’re looking for something to hold up over time and provide consistent performance day in and day out. These 5 options will get you started and demonstrate ways to evaluate scopes in this crowded market. If you enjoyed this article check out our tutorial on how to drill and tap a rifle for scope mounts.